On April 18, over a hundred volunteers from JPMorgan Chase & Co. once again flocked to La Mesa Ecopark as part of the global financial services firm's ongoing commitment to restore the La Mesa Watershed. Clockwise: Product of last month’s germinant nursing, JPMorgan Chase & Co. employees repainting sidewalks, potting soil and nursing germinants. 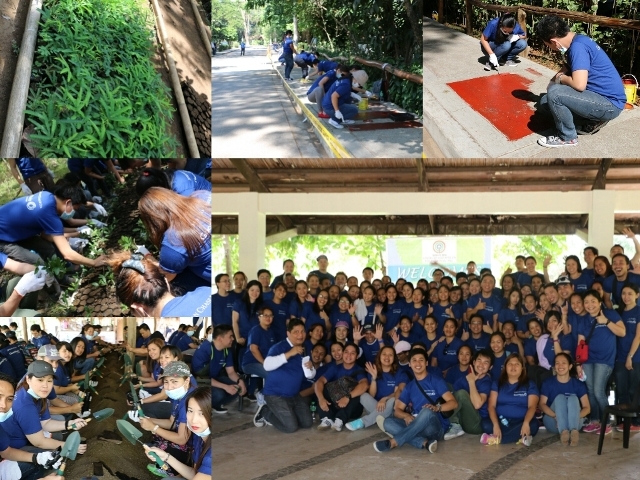 The employee volunteers were divided into two groups - with one group repainting the sidewalk of La Mesa Ecopark and the other group potting germinants or baby trees of endemic species (Bitanghol) in the watershed. To help with the preservation of the La Mesa Watershed, JPMorgan Chase and Co., in partnership with ABS-CBN Lingkod Kapamilya Foundation, Inc. (ALKFI), have committed to supporting tree-planting activities and restoring structures in the Ecopark that would encourage increased visits from tourists and raise funds to maintain the entire watershed facililty. Community development and workforce readiness activities are just some of the several outstanding employee volunteerism initiatives that comprise JPMorgan Chase and Co.’s Good Works Volunteers program. The bank also engages in other laudable philanthropic activities under ALKFI. In fact, JPMorgan Chase has been elevated to the Philippine Economic Zone Authority’s (PEZA) Hall of Fame for their Outstanding Community Projects. The tree-planting and other activities in La Mesa are just some of the employee engagement activities offered by ALKFI to interested organizations. If interested, contact Wilma De Lara at [email protected] / DL:415-6296 / 09156698425.